Through the years Sanford residents have watched their share of local baseball players blossom into professional stars. 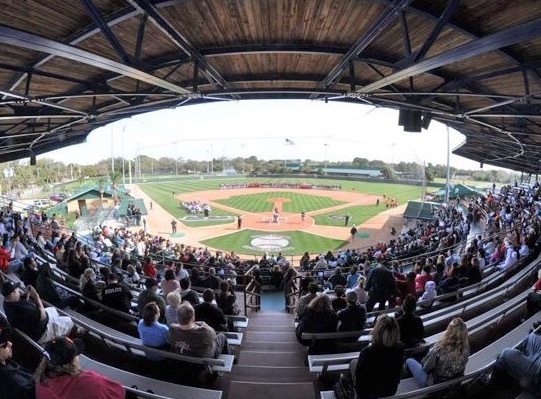 That tradition continues tonight as the Sanford River Rats host the Winter Park Diamond Dogs at Historic Sanford Memorial Stadium (Gmap) in a rematch of last year’s championship game of the Florida Collegiate Summer League. The view from the press box at Historic Sanford Memorial Stadium. The game starts at 7 p.m. and the River Rats will try to avenge their loss in the championship game in their home opener. Tonight’s game is also the start of the Florida Collegiate Summer League (FCSL or Florida League) 2015 season. The gates open at 5:30 p.m. Adult tickets are $5, while children (12 and under), military and seniors (55+) are $3. Any children age 6 or under are allowed in free. Hotdogs, burgers and other items will be available at the concession stand, and since it’s Thursday, Yuengling draft beers are $1. The River Rats are one of six teams in the FCSL (website) and a charter member of the league. The FCSL is a baseball league that provides an opportunity for college players to play wood bat baseball (college teams play with aluminum bats) against top-level competition with the goal of preparing them for a career in professional baseball. Baseball America has named FCSL one of the Top 5 summer leagues in the United States.Founded in 2003, the Forida League has had 287 players drafted by Major League Baseball teams – including 28 taken in the 2014 draft. The River Rats are one of the top teams in FCSL and a consistent presence in the championship game. In fact, the Rats won the very first league championship. They won the title again in 2011. Rats head coach and general manager Ken Kelly isn’t promising a championship for the 2015 season, but he does guarantee fans will have a good time. Classic fan games like the rubber chicken toss, the dizzy bat race and the baseball toss give fans young and old a chance to win prizes in a family-friendly atmosphere. And at every home game kids get a chance to go on the field in the middle of the 6th inning to run the bases, cheered on by the players. When they cross home plate, they receive a high-five from Ralphie the River Rat, the team’s mascot. “I wish we had a team like the River Rats when I was growing up,” he added.